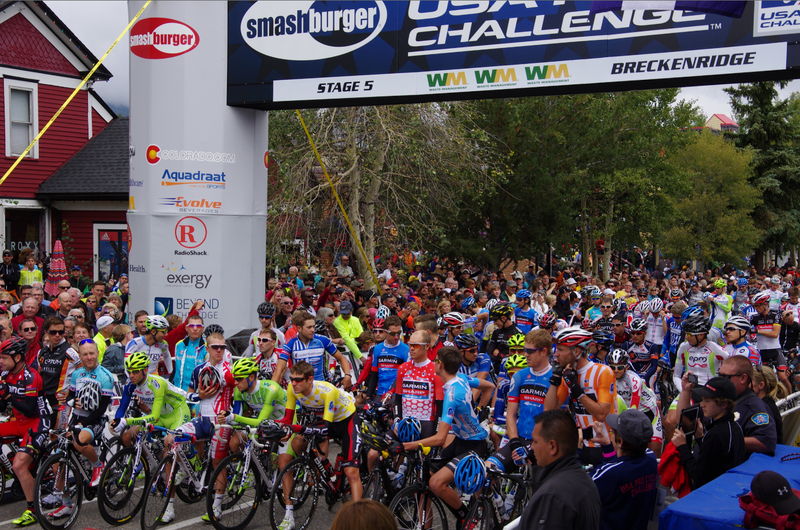 The USA Pro Challenge returns to Breckenridge, Colorado, for the third year. Breckenridge has played Host City in every USA Pro Challenges race to date. 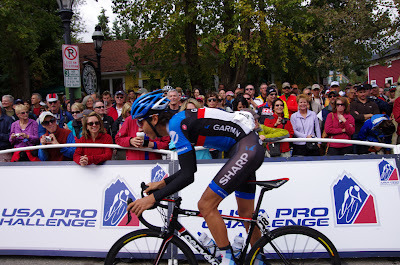 With options for entering the town from the south or north over climbs before finishing in a quintessentially picturesque Colorado mountain town, Breckenridge is well suited for vacationing spectators and fast approaching bike racers. Full road closure details for the Breckenridge area: All Colorado Road Closures for the 2013 USA Pro Challenge Bike Race. Also read local road closures. State Highway (SH) 9, US 40; Full road closures stop all traffic flow in both directions. Rolling Closures create short term delays of 30-45 minutes along the route. 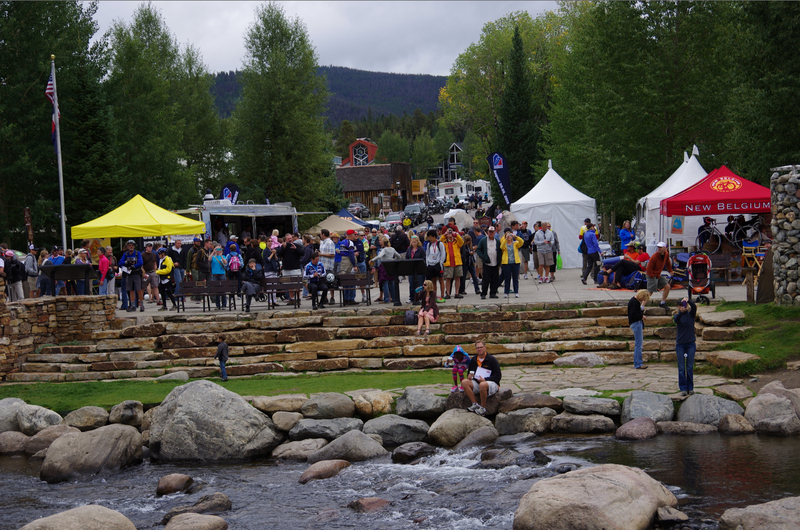 For Special Events associated with the race day(s) in Breckenridge, please see the GoBreck website for a full list of happenings. 12:00-2:30pm - sections of Hwy 9 to Hoosier Pass progressively closing. 1:00pm - Get in place along the route. 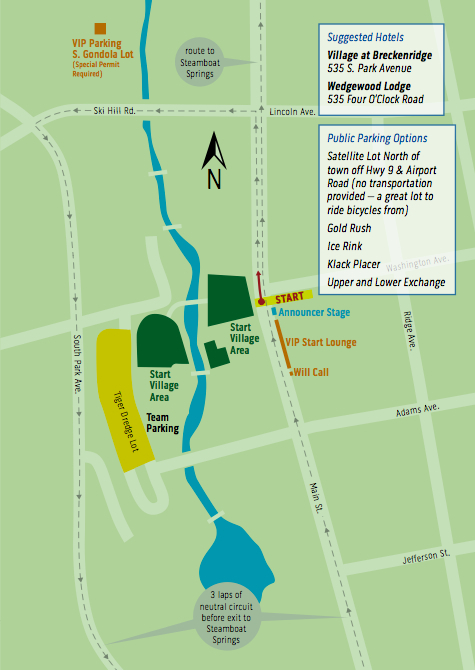 5:00pm - Roads reopen, except for Main St.
9:30am - Autograph Alley Opens near the sign-in stage on Main St.
12:35-12:50pm - Riders will be on Swan Mountain Rd. 1:00pm - Road SH 9 back into Breckenridge will reopen, and you will be able to exit north. 1:45-3pm - Hwy 40 Westbound over Rabbit Ears Pass closed. *My tip is to ride your bike into the venue or viewing site, or always be aware of road closures and park where you can get your car out if needed, especially if you want to continue chasing the race by driving to Steamboat Springs. 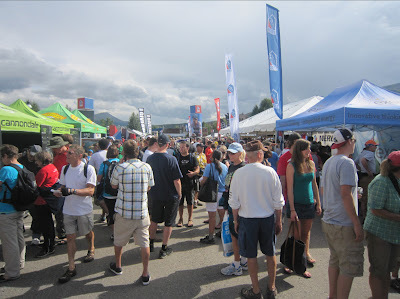 What VIP includes: a prime viewing spot on the race route, food, beverage, private access, tables & chairs, live TV race coverage, shade or shelter. See yourself on the Big Screen in Breck! If you can, Spend an overnight in Breckenridge; you will see the finish of Stage 2 (Tuesday) and the start of Stage 3 (Wednesday). When you are not watching the race - ride your own bike from Breckenridge to Frisco, continue to the top of Vail Pass; kayak or canoe on Lake Dillon (although the water is low this year); mountain bike on the local trails, enjoy the town events in the town of Breckenridge. 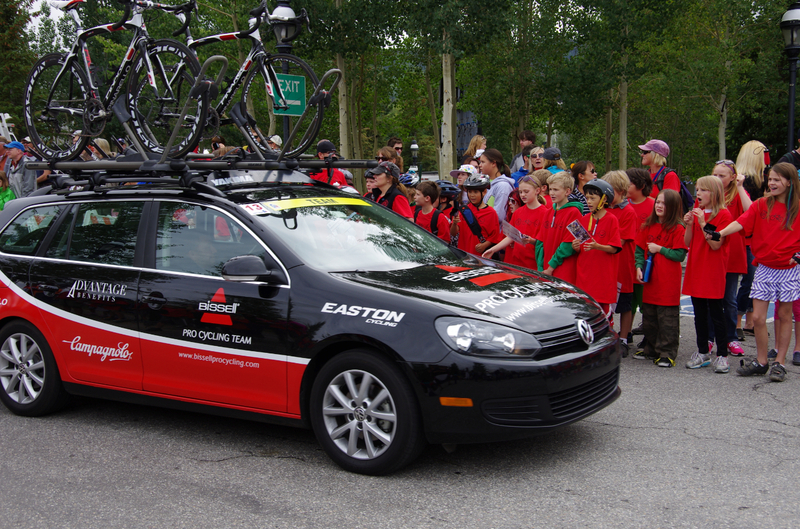 See a start & finish on the same day : Stage 2 see the Start in Aspen + the Finish in Breckenridge. See the Start of Stage 3 in Breckenridge + the Finish in Steamboat Springs. 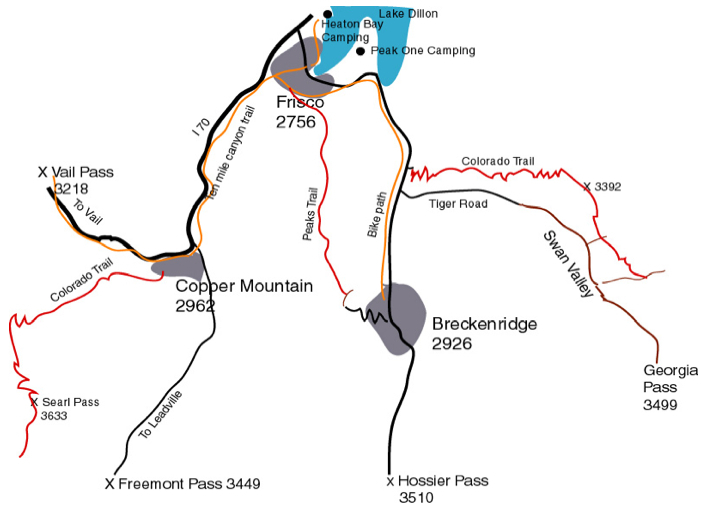 Be on a mountain pass mid-way in the stage: Stage 2 Independence Pass - 12,095ft (3,687 m); Stage 2 Hoosier Pass - 11,542 ft (3,518m); Stage 3 Swan Mountain - 10796 ft (3291 m). Stage 2: on Hoosier Pass or in the town of Breckenridge. 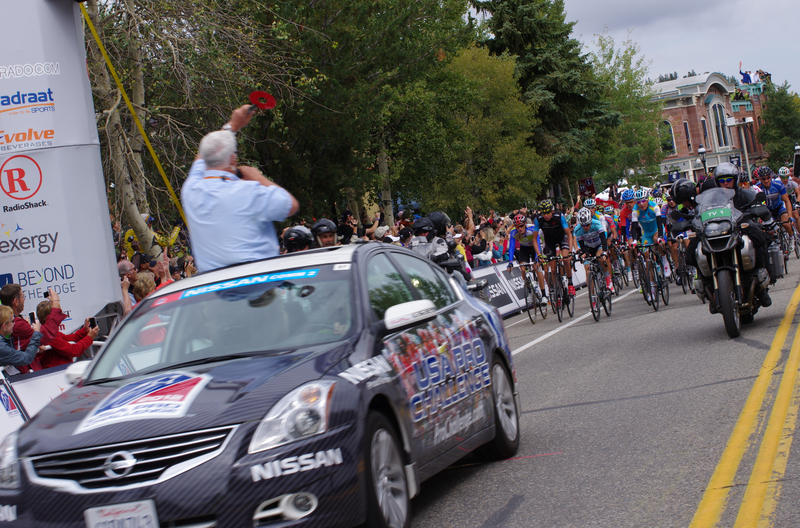 Stage 3: In the town of Breckenridge or on Swan Mountain Rd. 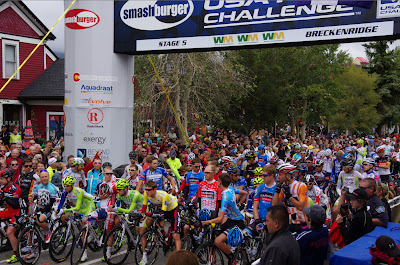 Stage 2: If you stay near downtown on Tuesday in Breckenridge you will be able to walk the Festival area and watch the race on the jumbotrons before seeing the finish. Although the barriers could become quite crowded by the time the riders arrive. 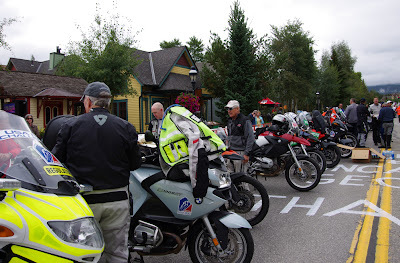 Just south of the downtown River Walk area on highway SH 9, there is a stretch of road between the corner at South Park Ave to the corner of Boreas Pass Rd where the riders will pass by twice. Once after descending Hoosier Pass, and a second time after looping town. The sprinters should be in place by the time the reach South Park Ave for the second time. 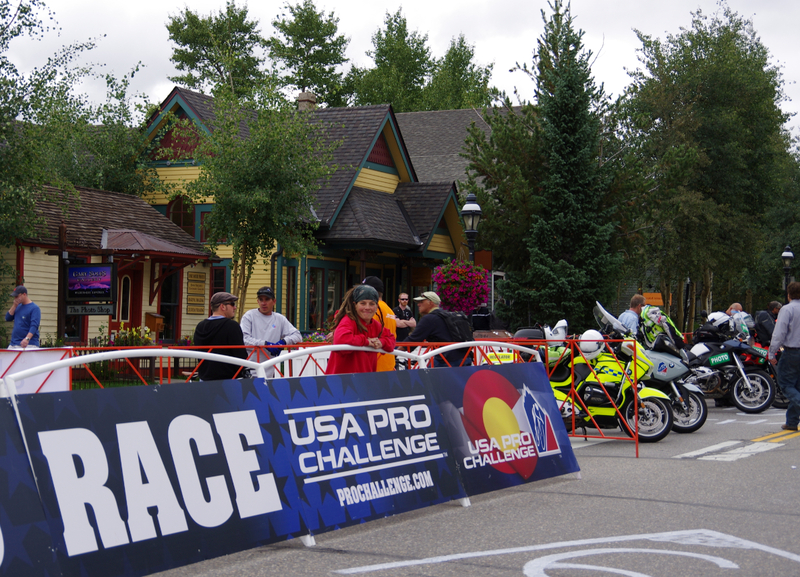 The climbing is not over once the race is within the borders of the town of Breckenridge. 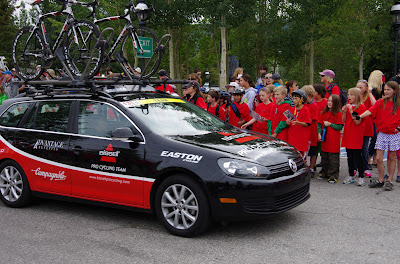 The riders still have the short steep (15%) climb of Moonstone Rd before the finish. This road might be another good viewing opportunity for fans. 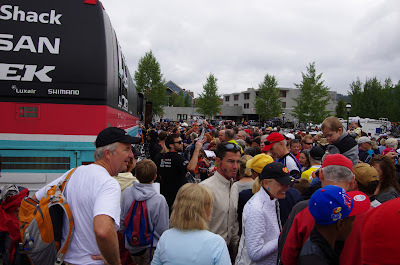 Stage 3: At the race start on Wednesday morning, the Team buses and Autograph Alley are the places to collect rider autographs. Team buses and mechanic trailers are the place to see the bikes close up. 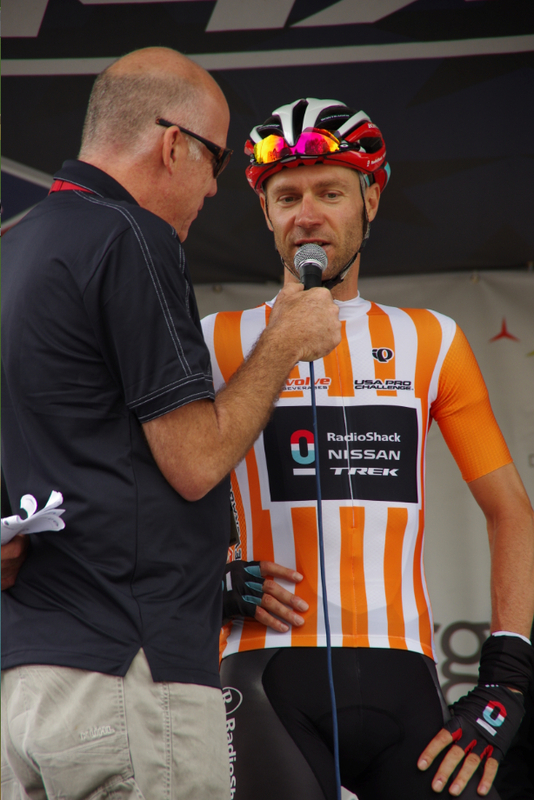 The sign-in stage (or nearby it to watch the riders freely riding by) is a fun location for good rider viewing and to hear the pre-race interviews by the race announcers. 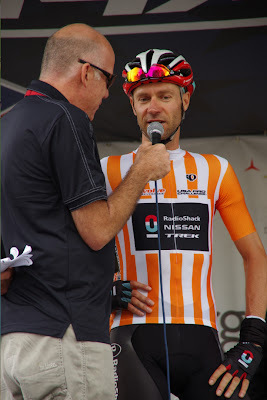 I like to get to any race early, to walk around when the crowds are light and find all the key locations and how to move between the start/finish line, stage, and team areas, or scout for a good viewing spot along the barricades, that way I know how to move around when the crowds get heavy. Arriving early also allows me to find a good cup of morning coffee! Swan Mountain Rd is the first climb of the day (Stsge 3) - just 9 miles down the road and waiting for the huge crowds it has supported in years past. Breckenridge is a ski resort, very active in winter and summer. The town is incredibly picturesque and fun to walk around. It has numerous shops and cafes. The Blue River runs through town, and there is a River Walk are with green grass and a fun play area for kids in the middle of town. There is good mountain biking and trail hiking in the area, mountain biking on the Colorado Trail, and a golf course on the outskirts of town, plus a mountain slide up Peak 8. Bikes may be rented in Frisco and Breckenridge for the day. There are bike paths all over the area. 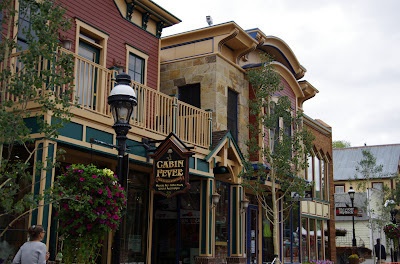 Frisco is 10-miles north or Breckenridge and has a large beautiful lake (Lake Dillon) with sailing and canoeing, and a downtown area with more shops and restaurants. 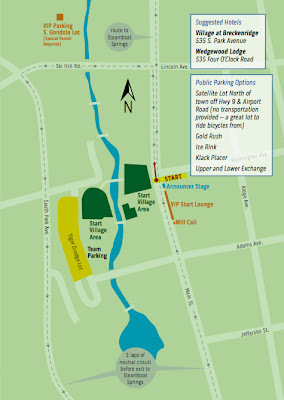 There is a Marina in Frisco, where you may rent boats if you go up 1-day early or stay longer. The Marina has a bar/restaurant with a view and patios. Good hiking can be found surrounding the area, and fishing in the rivers from Steamboat to Breckenridge. The city of Dillon also borders Lake Dillon and is located on the route of Stage 3 to Steamboat Springs, the town also has hotels, restaurants, and a Marina. Allow 1.5-2+ hours to drive from Denver to Breckenridge, plus additional time for parking and any traffic on the narrow 2-lane Hwy 9 from Frisco to Breck. Pay close attention to Road Closures. Accommodations is Breckenridge are geared toward ski condos and can be quite pricey. The town offer traditional ski town lodging which you can find here. For traditional hotels, the nearby towns of Frisco, Dillon, Silverthorne are very close and might be more reasonable. I like to simply insert "hotel" on a google map and see location and price all at the same time (Hotels in Summit County). Rooms are still available. 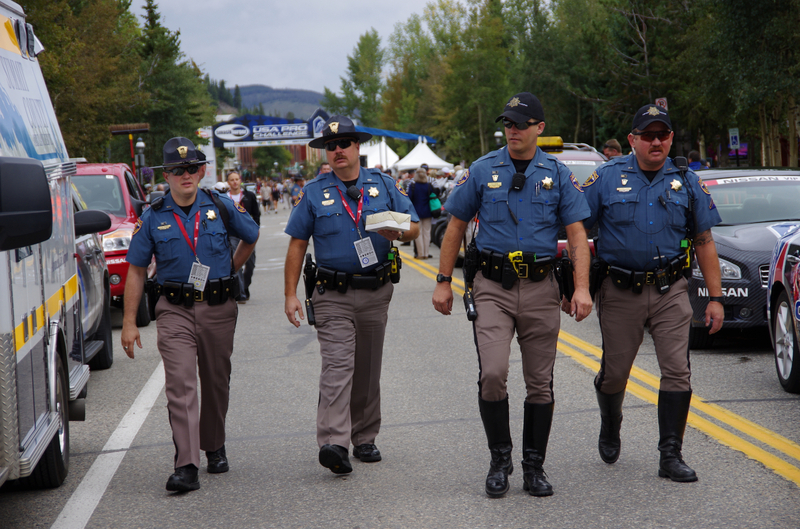 No camping is allowed anywhere along the route in the city limits of Breckenridge." Camping is allowed between Blue River and the top of Hoosier Pass, there are only a few spot at the USFS camping spot on Swan Mtn Rd. More information on Camping in Summit County. GoBreck -- dispersed camping is allowed w/in White River National Forest areas along Hoosier. Dispersed means 100ft off trail, 1/2 mile from water, and below treeline. If you have ?s about dispersed camping, contact Dillon Ranger District at 970-468-5400. We're investigating camping along the highway right of way -- and once I hear back will post a followup here in this thread. 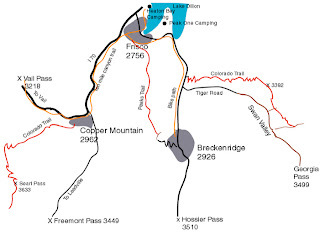 Camping is allowed along the race route south of the Blue River Town limits in unincorporated Summit County to the top of Hoosier Pass. For the stage 3 route, there are some very limited spots for camping available in the USFS campground on Swan Mountain Road. See the variety of bike rides listed at Summit Biking rides in Summit County near Breckenridge. 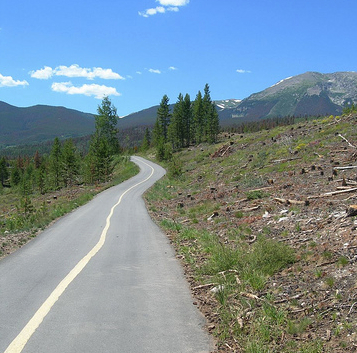 Mountain biking in Breck is good and the trails along the Colorado Trail are fun. Peak 8 Fun Park (up Ski Hill Rd) offers a Alpine Superslide sledding chute and lift/mountain biking on the ski slope in summertime. The gondola ride to the Fun Park at the base of Peak 8 is free from the parking lot in town. I used to live in Breckenridge and to be honest I had few favorite restaurants, so I would go simple - Empire Burger at 520 S. Main St, or Giampietros (pizza, pasta) at 100 N. Main St., any of the coffee shops with a snack, there are some good sandwich places in town or grab some ice cream at Cold Stone. Breakfast at the Blue Moose is good. If you need a steak, try the Kenosha Steakhouse.